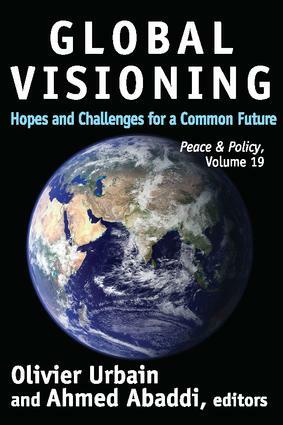 This volume makes the case for global visioning: the collective process of looking at a larger picture and building common ground for the future. The contributors agree that only by such a process will people be able to address mounting problems like global warming, war, terrorism, and poverty, which threaten the Earth's population. This latest volume in the Peace & Policy series addresses three main themes. "On Spirituality and Ethics" advocates an international culture of nonviolence. "International and Transnational Relations" makes a case for global fellowship. "On Education and Culture" argues that educating children is the first step in reforming the world. The contributors seek solutions to the question of how people can start seeing issues from a global point of view, rather than from narrow national perspectives. In keeping with the global nature and scope of the world's problems, the contributions come from very diverse countries, including Japan, Morocco, South Africa, Germany, Italy, Belgium, and the United States. This work will inspire participation in this much-needed exercise of collective global problem solving. by Lawrence Edward Carter Sr.
We All Have a Role to Play in Peacebuilding Because We Are All Connected around the World in Our Daily Life: What Are You Doing, and What Should You Be Doing?